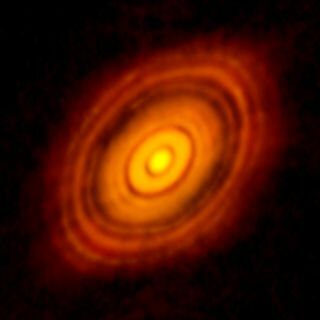 This ALMA image shows the young star HL Tau and its protoplanetary disk. A huge radio telescope in Chile has captured the best-ever image of planets forming around a distant star, researchers say. The spectacular view of planet birth, taken by the Atacama Large Millimeter/submillimeter Array (ALMA) in northern Chile, shows numerous concentric rings in the disk of dust and gas surrounding HL Tau, a sunlike star found about 450 light-years away from Earth. The stunning detail and clarity of the new ALMA radio telescope image surprised scientists. The new image is the sharpest ever captured by ALMA, researchers said. In fact, it's sharper than most photos taken in visible light by NASA's famous Hubble Space Telescope, they added. This image compares the size of our own solar system with the young star HL Tau and its protoplanetary disk. Although HL Tau is much smaller than the sun, the star's disk stretches out to nearly three times Neptune's distance from the sun. HL Tau is veiled by dust and gas, making the star tough to observe in visible light. But ALMA was able to pierce this veil, because the telescope is optimized to view the universe in much longer wavelengths, which fall between the radio and infrared portions of the electromagnetic spectrum. "This is truly one of the most remarkable images ever seen at these wavelengths," said NRAO astronomer Crystal Brogan. "The level of detail is so exquisite that it's even more impressive than many optical images. The fact that we can see planets being born will help us understand not only how planets form around other stars, but also the origin of our own solar system." This composite image showing the young star HL Tau and its surroundings uses data from the ALMA radio telescope array (enlarged in box at upper right) and NASA's Hubble Space Telescope. ALMA's design calls for 66 individual radio telescopes to work together as a single instrument. These dishes can be moved around the site using giant, 28-wheeled transporters. ALMA obtained the new planet-formation picture with its antennas spaced up to 9 miles (15 kilometers) apart, researchers said. This "baseline" enables a resolution of 35 milliarcseconds — the equivalent of being able to spot a penny from 68 miles (110 km) away, they added. "Such a resolution can only be achieved with the long baseline capabilities of ALMA, and provides astronomers with new information that is impossible to collect with any other facility, including the best optical observatories," said ALMA Director Pierre Cox.